JK Monarch presents the Landseer! Boasting over 2,800 sq.ft., offering 3-car garage & plenty of space for all! Great rm offering frml dining, nook & lg. kitch. space~Granite/Quartz cntrs, ext. hw floors, lg. prep island, full tile b/s. Office/Guest Rm on main w/ 3/4 ba. Upstairs offers 4 lg. bds+ Bonus/5th Bd+Master retreat w/ spa like ba~tile flr, full tile shower walls & tub, quartz/granite ctrs. Multiple designer options avail.~craftsman, industrial, traditional or modern! Design it your way! Directions to 8106 197th Ave E Bonney Lake, WA: **Do Not Use GPS**East onto Hwy 410 towards Bonny Lake, left onto Veterans Dr., Left onto Church Lake Rd. E., Church Lake about 2 mi. on right side. 8106 197th Ave E is a home for sale which includes 4 Beds, 3 Baths, 2,802 sq.ft. of living space, 0.11 acres of land, and was built in 2019. It was listed on 11-27-2018	and has been on the market cumulatively for 69 days. 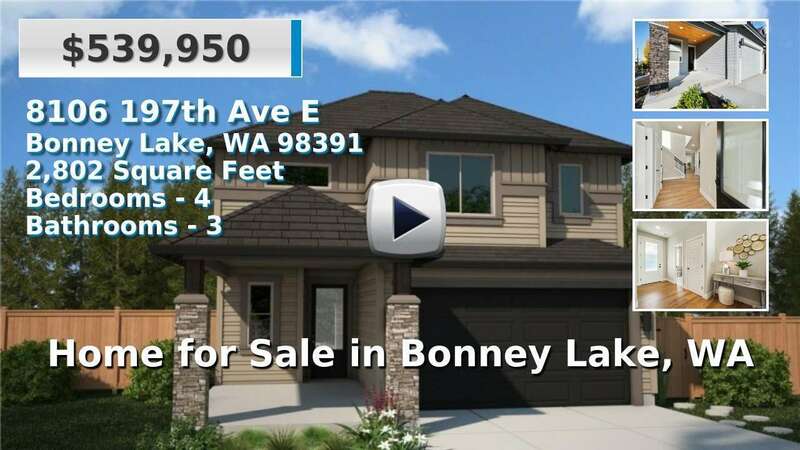 The list price of $539,950 is 0.04% lower than the median listed price of $540,165 for other real estate for sale in Bonney Lake. 8106 197th Ave E is also listed at 20.04% higher than median price of sold real estate of $449,810 in Bonney Lake. The price per square foot is $192.70 which is 5.76% lower when compared to the average price per square foot of Bonney Lake at $204.48. Want to see more real estate for sale? Search our available homes, condos, vacant land and rentals in Pierce County and Bonney Lake	.